DIAS pyrometers of series 10,40 or 44 are used for the measurement of the melting temperature. The suitable devices of series 40 and 44 are the types PYROSPOT DS 40N and DS 44N that are short-wave spectral pyrometers in the measurement range between 800 °C and 2500 °C. Depending on the type of system, ratio pyrometers of type PYROSPOT DSR 10N can be used as well. Besides the devices of the series 44 and 10 provide the advantage of a bus-compatible interface for the simplified integration in existing control systems. Crystals, which are drawn up from a melt in a so-called crystal growing system, are needed to produce wafers in solar industry. The crystal growth from a melt is activated by the slow cooling of the melt that crystalizes thereby. It is important to measure the temperature of the melt in this process, but also the temperature of the heating elements that control the process. Both has to be coordinated to guarantee an optimal crystal growth. Pyrometers with fibre optics and small optical head are preferred used for the measurement of the heating temperature because the space available is limited. 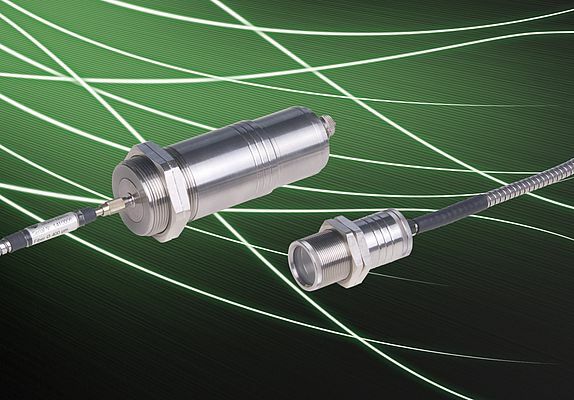 These pyrometers of type PYROSPOT DSF 40N and DSF 44N provide a measurement range between 600 °C and 1800 °C for example and small optical heads with only 12 mm aperture. Alternatively, optics with 90°-mirror-attachment or curved fibre optics are used. The measurement spot size is only of some millimeters aperture in all variants. The growth process is observed and controlled by the optimal interaction of the pyrometer variants for both measurement tasks.